To determine which individuals with colorectal cancer (CRC) were interested in knowing the results of their tumour microsatellite instability (MSI) and immunohistochemistry (IHC) testing. We were also interested in the patients' reasons for choosing to learn their results and in the impact of those results on overall self-assessed quality of life. CRCs from 414 individuals were assayed for MSI and IHC for DNA mismatch repair gene products (MLH1, MSH2, MSH6). Individuals were invited to learn their MSI/IHC results. They randomly received either brief or extended educational materials about the testing and a pretest survey to learn reasons for their interest and to assess their pretest quality of life. Of the 414 individuals, 307 (74%) chose to learn their results. There was no significant difference in interest in knowing test results according to gender, age, educational level, or family history of colon cancer. The level of detail in the information piece received by the patients did not influence their desire to know their test results. Self-assessed quality of life was not altered by receiving results and was not correlated with the test outcome. Individuals with colorectal cancer had a high level of interest in learning their individual MSI/IHC test results and did not seem deterred by the inherent complexity or ambiguity of this information. Regardless of test outcome, results did not significantly affect self-assessed quality of life. Further studies are needed to assess comprehension of results and behavioural changes resulting from the learning of MSI/IHC results. Microsatellite Instability testing (MSI) is not germline genetic testing. A high level of microsatellite instability (MSI-H) is a tumour phenotype that is known to be associated with defective function of tumour DNA mismatch repair (MMR). The MSI-H tumour phenotype is present in about 15-20% of all colorectal cancers (CRC) and in nearly all CRC from individuals with Hereditary Non Polyposis Colon Cancer (HNPCC) who carry germline mutations in DNA MMR genes [1–3]. Tumour MSI phenotyping is conducted both clinically and in research settings primarily to identify individuals who may have the autosomal dominant disorder, Hereditary Non Polyposis Colon Cancer Syndrome (HNPCC or Lynch Syndrome). In individuals with this disorder that carry germline mutations in the DNA MMR genes, nearly all tumours show the MSI-H phenotype . Thus a negative MSI test fairly well excludes a diagnosis of HNPCC due to hereditary DNA mismatch repair mutations. No work has been done on the interest, effect, adequacy, or appropriateness of communication of tumour MSI phenotyping results to patients. 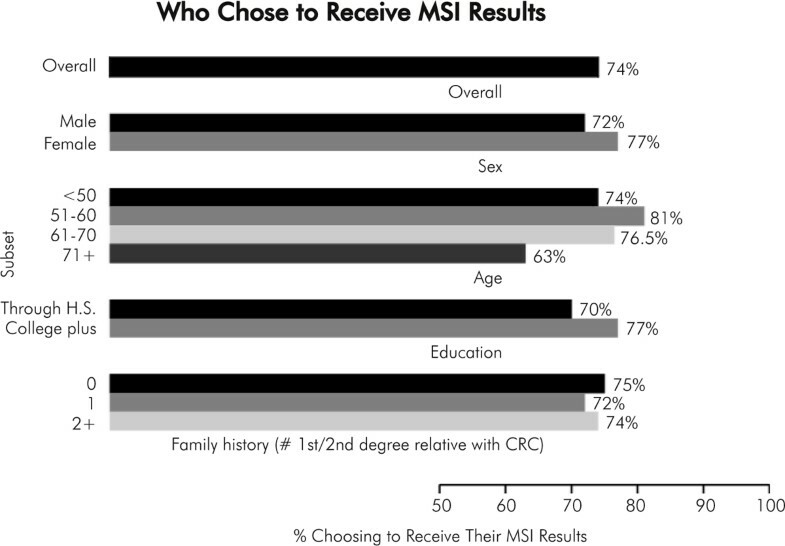 Do patients want to know their MSI results? Which patients? Why? The MSI/IHC story is more complex than just a negative or a positive result. In any series of colon cancers not preselected for high risk features (i.e., young age at diagnosis or multiple affected family members), tumour MSI-H will be present in about 15-20% of cases [4–6]. In these series, an MSI-H tumour phenotype does not necessarily indicate increased hereditary risks to relatives; in this situation, the defective DNA mismatch repair is usually secondary to somatic hypermethylation of the hMLH1 promoter. IHC in this setting will show loss of expression of hMLH1 [7, 8], (Kim 2003) but this occurrence does not have a clear Mendelian hereditary component. Thus a "positive" test (MSI-H tumour) is not diagnostic for HNPCC. In fact, among all patients with colon cancer, most MSI-H results are not due to HNPCC but are due to age-related methylation of the hMLH1 gene [2, 9, 10]. Therefore, unlike germline genetic testing for HNPCC where a positive result is diagnostic of a hereditary disorder, tumour phenotyping can only conclude that a person might have a hereditary disorder, but a positive test is not diagnostic for a hereditary disorder. The MSI-H phenotype is the gold standard for determining MMR competency in the tumour. Defective MMR in a tumour can be due to one of five known genes and perhaps more . Immunohistochemistry staining is often done as a complementary test to MSI, as loss of expression of one of the MMR genes indicates which specific gene is not functioning properly, thereby causing the MSI phenotype . Since direct DNA genetic testing is expensive and has only about 70% sensitivity in detecting mutations, tumour MSI/IHC testing has become the preferred first step in screening for MMR status of a given tumour; it is the starting point for trying to pick out individuals who may have HNPCC. A positive MSI test in a high-risk setting can identify those who should be offered germline genetic testing, and IHC loss of expression pinpoints which gene should be studied. We expect that in coming years clinical phenotyping of colon cancers will gain a second purpose, as early data suggest different responses to certain chemotherapies in individuals with MSI-H tumours. However, this preliminary information is unconfirmed and conflicting and does not yet impact clinical oncologic decision-making. Therefore, the current clinical utility of MSI/IHC testing is limited to identification of individuals who might have HNPCC, as this drastically effects screening recommendations and opens up options for germline genetic testing (which was NOT the topic of this study). As part of an ongoing colon cancer study, tumour phenotyping was conducted on tumour specimens from study participants. Because the results contained some potentially clinically significant information for some participants, we concluded that results should be returned to all individuals. As is evident from the opening paragraphs, explaining tumour MSI phenotyping and interpreting individual results is a challenge. We sought to learn what we could about which patients opted to learn their results, to determine what reasons they had for deciding to learn results, to determine the effect of detail (an in-depth explanation of testing versus a brief overview), and to assess global psychological reactions to being offered and receiving these complex test results via a written communication. The study scheme is shown in Figure 1. Ascertained through the Mayo Clinic to the IRB-approved Cooperative Family Registry for Colorectal Cancer Studies (Colon CFR), 414 patients with colorectal tumours and signed informed consent were included in this study. The Colon CFR is an NCI-supported consortium established in 1997, of which the Mayo CFR is one member. The Colon CFR was established to develop a comprehensive collaborative infrastructure for interdisciplinary studies in the genetics and genetic epidemiology of colorectal cancer. Detailed information about the Colon CFR can be found at http://www-dccps.ms.nci.nih.gov/cfrccs/q&a.html. The Mayo CFR consent form stated that if a clinically useful result was generated in the course of this study, participants would be given the option of learning those results. Participants understood that their data and materials would be used for colon cancer research, but the exact nature of studies to be conducted was not specified in the consent form as this registry is designed to support a great number of studies of diverse types for many years. The Mayo CFR participants were recruited from three different sources: the Minnesota Cancer Surveillance System (MCSS: a population-based registry), the North Central Cancer Treatment Group, and Mayo Clinic Rochester. All individuals who were under 50 years old at the time of their colorectal cancer diagnosis as well as individuals who reported a family history of colon cancer were invited to enrol in the Colon CFR. In addition, a random sampling of the MCSS listing was also invited to enrol in the colon CFR. Thus, our patient population was over-sampled for individuals who were at higher risk for having HNPCC, but also included subjects who were not at high risk for HNPCC. The exact number of true HNPCC participants in this group has not yet been determined. After consenting CFR participants to this registry, a three-generation family history was obtained, a detailed risk factor questionnaire was completed, blood specimens were collected and we asked for release of tumour blocks, if available, for additional studies. Participants were not specifically informed that tumour MSI testing or any other specific laboratory test was planned although they consented to use of their biospecimens and data for cancer-related research projects. Tumour microsatellite instability (MSI) testing and tumour immunohistochemistry (IHC) staining for hMLH1, hMSH2, and hMSH6 protein products were conducted as we have previously described . We developed a patient contact letter offering individuals the results of their tumour MSI/IHC testing. This letter went to all study participants on whom MSI testing was completed. We also developed two conceptually different educational pieces as we had no way to know in advance the optimal way to communicate results of this complexity and ambiguity. One educational piece was a six-page explanation of tumour MSI/IHC testing and its possible implications. The other was a one-page overview of MSI/IHC testing entitled, "Get to the Point, Doc", subtitled "For people who just want the bottom line". (These are available upon request). Patients were randomized (unstratified) to receive either the long or the short educational piece in the initial mailing. We also developed a survey to be self-administered before results were received to learn people's reasons for choosing whether or not to see their results and also to rate their current quality of life on a simple one item 0-10 scale. The Linear Analogue Self Assessment (LASA) items have been validated as general measures of global QOL dimensional constructs in numerous settings [13–17]. A series of five LASA items have been constructed and validated at Mayo for use in cancer patients . For those who responded that they would like to receive their results, letters were composed that showed their MSI/IHC results with a limited amount of interpretive text and, when appropriate, information on how to obtain individualized genetic consultation. (Genetic counselling was not funded through this study.) At the time the results were relayed, all participants received the educational piece that they had not gotten in the original mailing. Thus, all participants ultimately were exposed to both the long and the short educational pieces to assure that everyone received everything we could offer. We then surveyed again for quality of life on the single item 0-10 point scale and comfort level (again a 0-10 scale) with their decision regarding receiving their test results. 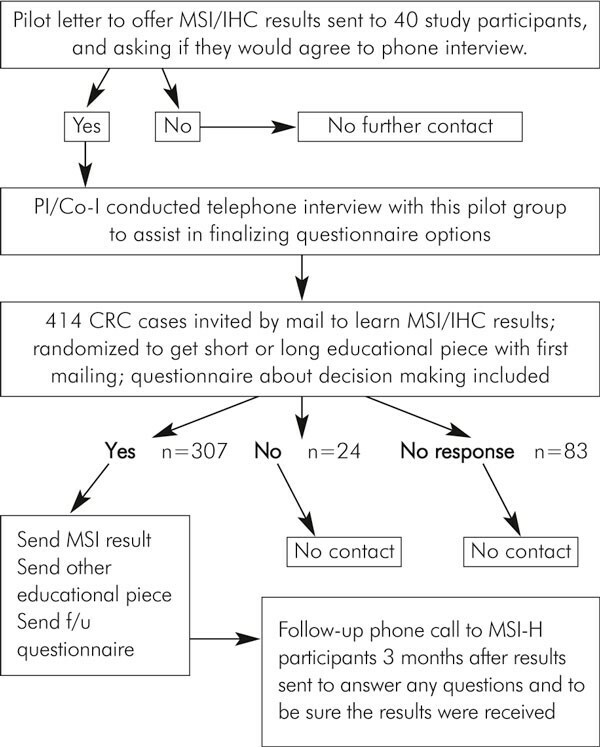 In addition, we made one follow-up phone call to inquire about subjective preferences for the long versus short educational explanations of MSI/IHC testing and to be certain that study participants had a chance to voice concerns, ask questions or clarifications, or to ask for re-mailings. Who wanted their MSI/IHC result? A total of 414 patients participated in this study, including 209 men and 205 women. Twenty-two percent had MSI-H tumours. Three hundred and seven (307) individuals (74%) responded that they did want their results, and 107 either declined their results (n = 24) or simply never responded at all (n = 83). We were not able to survey the reasons for declining or not responding to our letter although we could describe the demographics of this group as shown below. There was no significant difference between men and women in their interest in knowing their tumour MSI results: 72% versus 77% (p > 0.10). The majority of people of all ages wanted to know their MSI result. We found that 74% of patients under the age of 50 wanted results compared to 81%, 76.5%, and 63% at ages 50-59, 60-69, and over 70 years, respectively. We evaluated the influence that formal education might have on one's desire for MSI test results. In so doing, we compared the preference regarding knowing MSI results in those with up to 1 year of post high school technical school with those with one or more years of college. The majority of both groups, 70% versus 77% (p > 0.11), wanted to know their results. Family history was also not a determinant of most patients' preference. For those with no first or second degree relatives with colorectal cancer, 75% wanted results, compared to 72% in those with one affected first degree relative and 74% in those with more than one first or second degree relative (p > 0.10). We also assessed whether or not having children influenced desire to learn MSI/IHC results, but there was no significant difference between responders and non-responders according to having offspring. Figure 2 summarises the analysis of who wanted MSI/IHC results. Who chose to receive MSI results?. We determined that the randomly selected educational provision, whether long or short, did not affect interest in receiving MSI results. Of those who did not respond, 57 received the short piece and 50 received the long piece (p > 0.51). The participants were asked to rate eight potential motivators on a 0-10 scale, where 0 indicated it was not a factor at all, and 10 indicated it was an extremely strong motivator. The results are shown in Figure 3. 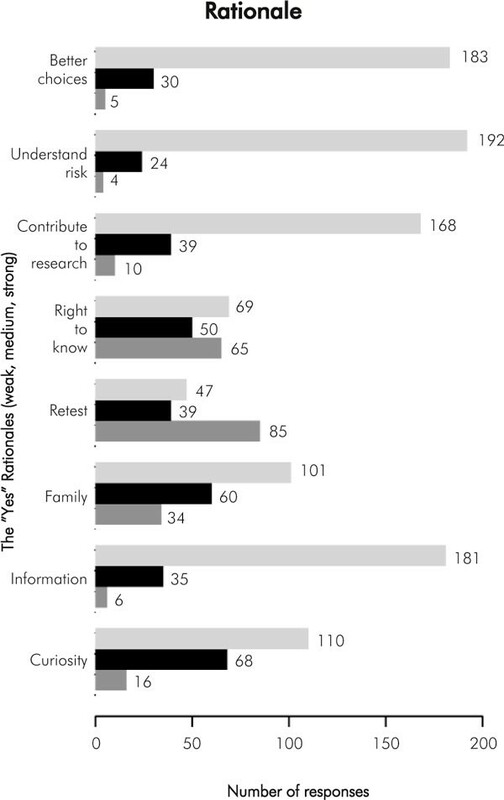 The greatest motivators appeared to be "helps understand future family risk", "helps me make good choices", "wanting all the information I can get", and "contribute to research". We also attempted to survey those who declined results; however, only four of the 107 returned the survey, so meaningful analysis was not possible. After test results were sent out to all interested participants, we compared their overall self-assessed quality of life (QOL) before getting results to the quality of life after receiving results. They had ranked their QOL on a single item 0-10 scale, in which 0 was described as "not at all happy with quality of life now", and 10 was described as "very happy with quality of life right now". One hundred thirty four (68 men and 68 women) of the 307 participants who got the MSI results completed the QOL scale before and after they knew their results. Among men who got a "normal" result (no MSI in their tumour; n = 54), there appeared to be a slight decrease in QOL rating (but not statistically significant; p = 0.62), whereas women (n = 53) with normal results showed no change at all in their self-rating (p = 0.99). In the group that got the "abnormal" results (the ambiguous result of MSI-H tumour with various immunohistochemistry results), men (n = 14) appeared to show a slight improvement in QOL, though not statistically significant (p = 0.53) while women (n = 13) showed a slight trend toward decrease in self-rated QOL (p = 0.19), but again, not statistically significant. We analysed the QOL ratings broken down by educational level. Fifty four participants had less than one year of post high school education, and 72 had one or more years of college education. Educational level did not correlate with overall change in QOL in either group regardless of their MSI results. We analysed the self-reported change in QOL stratified by age and found there was no significant change in QOL in any age group no matter what the MSI results were. We looked closely to see if even a slight trend toward a change in QOL was emerging, but receiving MSI results of any type seemed to be a neutral event with respect to QOL. MSI/IHC testing has made its way into clinical practice without any discussion whatsoever in the medical literature regarding whether or how to communicate its meaning to patients. Within the genetic counselling community, some consider MSI testing to be included under the genetic testing umbrella. However, this seems an inaccurate assignment, since no type of MSI/IHC test result can distinguish hereditary disease from non-hereditary disease. MSI/IHC is a sophisticated and clinically useful triaging instrument for which there is no analogous test, i.e., a test that is very good at ruling out one form of hereditary disease (hereditary DNA mismatch repair deficiency/HNPCC) yet is incapable of establishing the diagnosis of that same disease. An MSI-high test result means it is possible that one has a hereditary disease, but further testing (germline genetic mutation detection), integrated with clinical data and family history, is necessary to assign medical significance to an MSI-high result. Given the complexity and ambiguity of MSI/IHC results, we were not sure if patients would be interested in learning their result. We learned that three-quarters of all patients enrolled in the Colon CFR were interested in getting their results. When we sought to find out if the sort of explanation provided of MSI (detailed versus brief) would influence test uptake by patients, we were unable to identify a preference for detailed versus brief educational explanations and follow-up phone interview did not elicit any preferences. We were also interested to see if participants' interest in receiving test results was affected at all by differences in gender, age, education level, and family history of colon cancer. With the information gathered in this study, we could not identify a subset of patients that was different from the whole. As the final question explored in this study, we found that test results generally did not adversely affect self-assessed quality of life as measured in this study, regardless of the test result. The level of overall interest in receiving MSI/IHC results was higher, in our experience, than interest in receiving research-based germline genetic test results. In offering back germline test results in some family cancer syndromes, only 25-33% of our invited study participants responded that they wanted their result (unpublished data). We speculate that the greater uptake for the MSI results may be due in part to the fact that we do not consider MSI/IHC testing to be genetic testing, (a perspective put forth in our educational pieces). Therefore, MSI/IHC test results may not have been felt by patients to carry the same potential social stigma as germline genetic test results. Similarly, because MSI/IHC testing is one step removed from diagnosing a hereditary disease (it is a triage tool), there may be less psychological trepidation about learning the result. It is important to recognise that a second explanation for the high interest in receiving these results may be that Colon CFR participants are a selected group of individuals that are particularly motivated and interested in research, as shown by the fact that they did enrol in this registry in the first place. People's reasons for wanting their results were multiple. While curiosity was a common motivator, much more strongly endorsed reasons for wanting MSI/IHC results were "helps understand future family risks", "helps me make good decisions", "want all the information I can get", and "contribute to research". The least compelling reasons for wanting MSI/IHC results were "to compare to prior result" and "asserting my right to know". While our study breaks new ground, its design had several important limitations which need full acknowledgement. This study group is clearly not representative of all colon cancer patients, noting that the participants' enrolment in the CFR study was voluntary, indicating a level of cooperativity and interest in supporting research studies. Further studies would need to be conducted on colorectal cancer patients in different settings to determine if interest in knowing these results and reactions to learning results hold true for different populations. Secondly, this group was not ethnically diverse (98% Caucasian). Thirdly, we provided results in writing. While other research studies may use this approach when individualized genetic counselling is not feasible, it is likely that patients seen clinically will have an opportunity to discuss MSI face to face with their clinician, which may influence their decision differently from our written materials. A fourth limitation of this study is that we do not have long-term follow up of reaction to knowledge of MSI results. In addition, patients were not given a choice of receiving their results in person, by phone, or some other medium, so we have no point of comparison with which to compare these study results. Lastly, and very importantly, we do not know if patients truly comprehended the implications of their MSI/IHC results and whether or not these results led to changes in health care behaviours. Testing understanding of material or factual retention or behavioural change was not part of this study. Clearly there is much room and need for further studies on the impact of MSI/IHC testing in a variety of clinical and research settings. Umar et al recently published updated Bethesda Guidelines defining the subset of colorectal cancer patients on which MSI testing is recommended . As this standard of care is adopted in clinical practice, the utilization of MSI/IHC testing will increase substantially. It is important to explore the ramifications of this testing on the individuals being tested. In summary, we learned that there is a high level of interest among all types of colon cancer study participants in the Colon CFR in learning individual MSI/IHC test results, and providing individual results by mail, accompanied by written educational pieces, was acceptable to this group of patients and did not appear to change their quality of life. This study is the first to explore the issue of returning MSI/IHC results to patients. Further studies on relaying MSI/IHC results to diverse colon cancer populations are needed to further refine patients' needs and preferences and refining the educational methods for this communication. We want to express our deep appreciation for the ongoing support of the many families who have participated in this study for their considerable time and effort in responding to our requests for information. This work was supported in part by the National Cancer Institute, National Institutes of Health under RFA # CA-95-011 (Mayo Clinic Cooperative Family Registry for Colon Cancer Studies: U01 CA074800) and through cooperative agreements with members of the Colon Cancer Family Registry and PIs. The content of this manuscript does not necessarily reflect the views or policies of the National Cancer Institute or any of the collaborating centres in the CFRs, nor does mention of trade names, commercial products, or organizations imply endorsement by the U.S. Government or the Cooperative Family Registry for Colon Cancer Studies.